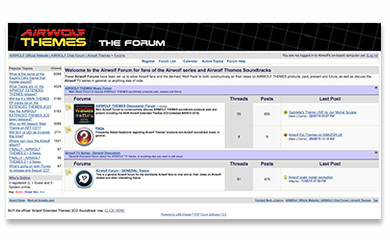 Become a member of the Airwolf Themes Forum and leave feedback on the website, discuss the music and everything connected with Airwolf. AIRWOLF™ is a Trademark of, and licensed to NBC Universal Television Studios © 1984. All images and multi-media content of this website are Copyright Mark J.Cairns © 2007. Under NO circumstances must any images or digital content be used from it on any other websites or media without the express written consent of the Copyright / Intellectual Property owner. All MP3 theme tune files remain the Copyright of Mark J.Cairns and Sylvester Levay © 2007. The Airwolf Themes soundtrack is the officially licensed score based on the original CBS episodes of the Airwolf TV series. The Replica Helmet is Copyright Steven. W. Stull © 2007 and is only marketed and promoted in good faith on his behalf within this website, but neither Mark J.Cairns nor anyone on the project team receive any benefit whatsoever whether fiscal or otherwise thus any and all communication must go directly to Steven W. Stull.